You are holding in your hand an unusual book not found in libraries. It explains concepts about the structure of the atomic nucleus, gravity and the source of the energy that runs the universe not yet theorized by modern scientists. This book was designed around a Russian Babushka egg concept. Each set of differently sized egg-shaped dolls of the same design nest one inside the other. Only the scale is different, and so it is with my books. Each is filled with many detailed scientific observations discovered in nature from different perspectives used to investigate our universe. They range from the many galaxies scaled down to the lowest electromagnetic frequency spectrum. The smallest egg is a single, donut-shaped atom. This book describes how it was first created and how it works. There could not have been a big bang 13.4 billion years ago without that first atom. How it got started is my story. My other Babushka books (briefly described at the end of this book) relate my discoveries of many new scientific facts never postulated before. For example, the many mystery bronze-gold clocks in museums not deciphered by the specialists are explained in Asteroid Answers to Ancient Calendar Mysteries. The news media seem perplexed about the many outbreaks of swine flu, salmonella, e-coli and unknown stomach ailments not responding to biological drugs such as in the deadly spinach and peanut fiascos from eating GMO foods. Why are so many afflicted, sick and dying? The media and government officials do not link these outbreaks to the dangers of genetic modification by international corporations who use the general public as experimental guinea pigs, but that is the probable cause. Become informed about the risks to you from genetic modification in my book, Genetic Modification Exposed! Global warming also causes great confusion, so I wrote a short book titled Reflections on Global Warming. These topics and many others are connected to Bible prophecies of the apocalypse now started in 2008 and due to intensify through 2015. Then, another news flash caused upset scientists to ask, “Why are the many IPK Platinum Standard Kilograms gaining weight, becoming obese after 135 years?” No one has the answer yet, but that question led to this Donut Atom book. Here in my last book we will investigate what an atom really is from a biblical viewpoint. Its structure is not yet very well understood by the experts largely due to their belief in evolution fairytales. I present a more balanced perspective to give a better understanding of science. In the process, I noticed that every science mystery mentioned in this book is now revealed in more detail, as each complies with a common denominator by conforming to the laws of physics linked to an infinite energy Alpha source. Scientists are not familiar with the infinite gravity power disbursed throughout the universe and how it is scaled down by the structure of each atom, which functions like a transformer to convert this energy for our use. It is how infinite energy is transformed into visible light spectrum coming from space, which ends up on a lower spectrum frequency with signatures embedded of all elements categorized in the Periodic Table. This energy originates from galaxies and transfers in parallel intelligence information by spectral lines within the rainbow colors and ending with a better atom model that even my kids could understand. Beautiful pictures of galaxies in space give us a visual representation on a large scale of what an atom looks like as the laws of physics are the same. In the natural universe, we can learn about the smallest Babushka egg by studying the larger ones. This approach evolved into my new and original Donut Atom Model. I use the egg illustration to teach the laws of nature defined by Dr. Albert Einstein and Isaac Newton, but intertwine them with the metaphysical world. Atheistic scientists do not know about the spiritual dimension embedded in the Bible, which is the oldest book in the world and reveals God’s Plan for Humanity. Including biblical data in science helps to explain many recent discoveries upsetting scientists. Many are puzzled by the possible reasons for why the platinum IPK world weight standard has changed its weight. Rational answers for this and many other unknown phenomena elude them because they lie in the realm of metaphysics that cannot be measured by scientific instruments. In fact, scientists still do not know how life is embedded in atoms. They do not know whatgravity is or where the force of magnetism comes from. Neither do they really know how electricity is formed inside a wire loop passing through a magnet! This invisible energy embedded in atoms can be released resembling a genie spirit from the Arabian Nights bottle. Once out of the bottle, it cannot be controlled. On earth we have cleverly utilized its power by managing it with knowledge and can witness the same intelligence embedded in galaxies that still shine with their lights still on after the Big Bang. Nothing can only produce Nothing; therefore, I ask, “Where does the Something come from to produce the Big Bang?” In this book I will logically contrast the opinions of scientific fairytales with the observed facts of the universe that we must accept as truth because they have many witnesses. I will do my best to include all information available from the knowledge pool of mankind - including the metaphysical dimension that cannot be measured by scientific instruments but are recognized by a child. If you are not biased by an atheistic evolution religion, the mystery of the metaphysics can be explained in physics. We need only a few illustrations to understand it logically. For example, a transformer has two energy potentials: one on the high input side and the other scaled down. It is the same when we look at a galaxy. One can compare it to an atom, or vice versa, as all conform to the same laws of physics. But in physics we can only measure the reaction of a force with material instruments. It is like an electrical transformer where the electrician can only guess the potential input side because we do not have instruments capable of measuring metaphysical power or - say a million volts as only the output side of 110 volts is useful for people that is not life threatening. A counter force according to physics must always have a cause and can only be defined by its reaction. The invisible starting point by its definition is undetectable by our five senses: touch, smell, hearing, sight and taste. One might include the unusual sixth (+One) sense. If you can define that one, you will earn more money and perhaps a PhD. However, opinions are always biased by our belief systems. Some believe in an unscientific atheistic evolution religion not conforming to entropy. Some believe in God’s oracles collected in a 4,000-year old Bible. Conversely information from the metaphysical world can only be revealed, so I am sure that we will keep on wondering about the many unsolved science mysteries. The biggest puzzle to me is why scienti sts are still building bigger cyclotron atom smashers in Switzerland. It only will produce more fragments like all the others, which can never, ever reveal the purpose why an atom exists and how it functions. As we will explain it later, the neutrons with neutrinos polarity create Gestalt within the nuclear atom that cannot be fractured energy wise, as the plasma beam of a cyclotron is infinitely small - merely like a burning match compared to a lightening bolt seen on my ranch. A plasma beam will never reach the energy level needed to split atoms made up of neutrinos. The neutrino inside an atom has a trillion x trillion x trillion infinitely higher energy level of protons-positrons linked like a horse and carriage. Only the proton carriage can be made smaller or bigger creating atoms. The neutrino horses inside the atom are the nuclear energy source will always adjust to the number of protons present no matter how big the atom is spooning with another atom. Understanding that would make cyclotrons obsolete. we will not understand the house we live in. In the universe all the laws of nature must link to the Alpha (+One) force originating in the Heh (metaphysical) dimension and can only be understood reading the Bible. That book of books connects the physical Daleth dimension with the metaphysical Heh dimension. Nothing can only replicate itself into Nothing – Never over 100%. Defining nature always starts out with the First Law of Entropy where mass is amorphous, an unstructured nothing below 100% not yet completed or crystallized. Investigating it from potential energy frequencies, we assume a half-life decay for every element by using a light speed scale time dimension. But if light would be faster or slower, that would change the half-life, too. In the metaphysical nuclear physics, it is revealed by just looking at the Hebrew letter ( h) “Heh” a horizontal line below two vertical legs. The horizontal line reveals the only one omnipresent God in a concept but below the horizontal line expanded to a creation the beginning of a foundation for a cosmos universe - Beth. When we take away one leg in the Heh letter it converts creation in another Hebrew letter ( ד ) Daleth expressing a time dimension which did not exist before the big bang. More is explained at the end of this book. This exercise in Hebrew letters philosophically indicates embedded laws are designed now for a change like the biological world oxidized faster before 4004 BC. The system is getting older according to predetermined settings or a plan to degenerate DNA molecules to become less than 100%. This means that living things since Adam got kicked out from the Garden of Eden die from sickness or pass away some other way in a decaying process heading toward Taw, the end of the Hebrew alphabet. It needs the added intelligence expressed in a formula for the other side of the equation articulated in the Second Law of Entropy to give us life one notch higher. It operates like a teeter-totter. To make it into something over 100%, it must be linked to the Heh dimension toward the infinite energy source to give Gestalt to every atom. Consequently mass (the elements in the seven rainbow color spectrum) are created by a process concentrating infinite energy crystallized out in a parabolic time dimension (+∞C/–∞C)² and scaled down like a transformer to a sustainable level for mortals as now defined in the true physics presented in brief here. God’s Plan for Humanity designed the cosmos for human beings with divine laws to operate within the visual spectrum of mortals, which is the center of the frequency range and becomes a visible energy spectrum as science measured the speed of light to be 186,000 miles/second in 2009, but that speed keeps slowing down as Dr. Albert Einstein noticed. Recently, many more scientists now agree. New discoveries prove that light is slowing down from the Heh infinite energy level getting a little cooler. It is perfectly fine-tuned for mortal life to operate under. Life cannot function at higher electromagnetic frequencies like X-rays, alpha, beta or gamma rays. All biological life was designed to be fine-tuned on a very narrow visible light frequency bandwidth. Light is therefore the carriage for life inside the Donut Atom, which is a transformer to convert infinite energy into the lower range 110 volts everybody uses and doesn’t kill you. Let’s have a closer look at how that would change many existing opinio ns about science and even could explain the paradox of Global Warming. We mortals live in the Daleth dimension as time must be delayed a little otherwise squared time according to Dr. Albert Einstein’s E=mC² is too fast for our biological world as demonstrated by the atomic bomb or the Big Bang bomb 13.4 billion years ago. The Hebrew calendar embedded in Genesis is more accurate. It and other ancient calendars demonstrate a parabolic time curve that tells us the Plan for Mankind was predetermined at 7,000 years, a time concept I can understand on the Daleth side. Since the original Big Bang initiated the first something to shape a universe raised from the nothingness of Kelvin zero temperature Taw. Kelvin represents the black hole of nothingness where all was formless and does not have yet Gestalt as something appeared later after the original Big Bang embedded it in a vast absolute cold empty space. It needed infinite energy to bring it into existence one notch higher controlled by divine intelligence to make it over 100% and turn the nothingness into something expressed in the Second Law of Entropy. When the Big Bang showed up it needed intelligence to direct the force on which way to go. Otherwise it could go either way - an explosion or implosion in the opposite direction. Divine intelligence was needed to form atoms linked to the Alpha force winding up the universe like a cuckoo clock to run the cosmos gravity flywheel controlled by a pendulum measuring energy in smaller chunks for life to exist. Thus, the cuckoo clock in my home illustrates the cosmos. These ideas will remain mysterious to most scientists because they believe in an atheistic evolution religion and mistakenly purged every Bible from the universities. Therefore, having lost the science information in the Bible, the academics will still be searching and foolishly spending tons of money by building bigger cyclotrons and never finding out the real answers. Our Donut Atom book is linked to the Bible for a better understanding of science. It expands our horizons towards a fantastic vision never preached in church or in the halls of higher education. I am still discovering more. It seems to be never ending and will in time make all of the cyclotrons and the atheistic evolution religion obsolete to save both a lot of time and money. Check out the Forum Pearls on the web site for updates. This picture shows Nebula NGC 2392, called Eskimo. It is 5,000 light years from Earth and illustrates perfectly the Big Bang or a Donut Atom as the same laws apply. I use many examples from familiar things in nature to explain my novel model for the structure of an atom’s nucleus and a bit of the theory behind it. Even so, I know it requires a lot of imagination. A little patience would go a long way to reward your reading. I offer insights from my own innovative perspectives proven by my history of successful hi-tech inventions, though I was not educated in lofty places to understand nuclear physics. When you activate the electrical switch on your wall, the light goes on and even turns on the TV. I ask the question; what is the force inside the wire? Where does it come from? The answers will be discussed here. The problem is that no one has yet figured out where the energy begins to form or explain where it really comes from. Now for the first time, we can learn about a new logical concept even embedded in the Bible. God reveals it to those interested in knowing about it. Along the way will also learn a lot about God’s Plan for Humanity as recorded in the Bible because this Donut Atom theory has roots in ancient Scripture. As a scientist, I was compelled to share this discovery of a marvelous plan for mankind. I could not keep it quiet, so I tell an original story what nobody has ever heard of before. Maybe it will qualify someday for a Nobel Prize in physics. This little booklet is not religious. I do not endlessly quote the Bible. I am a retired scientist who must have rational and logical answers to my questions: what is electricity, gravity, magnetism and life? I am not satisfied with the answers provided by evolution-based science. Most atheistic university establishments are only interested in selling their opinionated fairytale books to gullible people as facts. Basically the information they sell are only opinions. I look beyond their theories and under the covers. I even discovered how life is embedded inside an atom. Science investigation will always be biased either by an atheistic evolution religion or Bible-based faith, but research tests, hypothesis and proposals must not forget logic in the equation. The conclusions must be compared with the reality that two dimension exist. Denying the spiritual aspect of man will never discover reality. Wrong assumptions can never discover facts. I do not hide my opinions shaped by information found in the Bible, which prove hard science. If you want to be fair, we should view science from a circular 360° perspective. If you do so, you might even get yourself as excited as I am discovering electricity … no kidding. My books came through intuition and research for a balanced perspective AND ARE FREE! God does not charge us to read what he wrote to educate us about what is on the other side. It is a place we all will eventually travel to. People commonly know about and experience three forces in nature that are mostly invisible unless you do something similar to what I did as a kid. (Yes, I once stuck my finger in the electrical socket! I never forget it.) One is magnetism, the other is electrical current, and, if we pulse that current high and low, we get something called voltage. I think it links to gravity, also invisible, and follows a similar pattern. Many years ago, I helped build up SLAG, the Stanford linear accelerator in Palo Alto, CA. I made klystrons, which gave me an opportunity to get involved with advanced science and try to visualize the smallest particles in physics. I was taught then that the atom is a ball with electrons circling around it, but I have now come to the conclusion that it more resembles a donut with invisible energy proton-positron pairs bunched together that create a current with oscillating high and low voltage going around it at the speed of light. It is like a dog chasing its tail. My model conforms to the electrical hand rule applied in an electrical generator where motion passing a conductor is converted to magnetism radiating 90° from the flow a moving current creating forms of light energy ending in seven color electromagnetic frequencies. I applied the electrician’s three finger rule to my Donut Atom model, which tells me that magnetism is produced by neutrino-positrons orbiting inside around the donut hole at the speed of light. It is analogous to a plasma beam inside a cyclotron surrounded with magnetism radiating 90° to the plasma flow all around in a closed circle just like a nuclear donut hole. In our case the plasma beam is made from a billion pairs of neutrinos-protons that behave like the horse pulling a proton carriage. The neutrino is the energy transformer side like a horse passing on its energy from the Heh Dimension in form of gravity from the infinite light energy spectrum located throughout space. The carriage proton linked to the horse will create spectral lines seen in light spread out in a rainbow spectrum which ultimately crystallize out as mass and condense as elements categorized in the Periodic Table. The Donut Atom model states that the subatomic energy particles circle around like a dog chasing its tail producing magnetism. Meanwhile, another energy conversion simultaneously happens similar to how a generator produces electricity for light and heat but on a lower level. The universe is analogous to a huge cyclotron transferring energy. Stand on the top of a dam with a huge lake behind it and observe. It collects water and transfers energy converted by means of a generator made up of spinning magnets below the dam. This process produces another form of energy, which is reduced and transferred by overland wires to you as electricity to light your house and a refrigerator with the little magnet stuck on the door. That is not the end of the cycle, as money must be paid to the investor who will build more spinning turbines with another dam behind a lake. The lake needs regular inputs of rain to be refilled on a cycle to keep generating the electricity. That cycle depends on the sun evaporating water to create clouds and rain to fill the lake. But the cycle keeps going and needs the sun. It is just another transformer station that steps down the infinite energy, but this time the source is a bigger energy generator cyclotron - the Heh dimension Throne of God. Infinite gravity energy is stepped down through the core structure of Donut Atoms inside the sun to appear as measurable light 186,000 miles/second plus excessive leftover gravity. Throughout space, the immeasurable gravity energy is evenly disbursed and linked to every Donut Atom transformer by countless mail carrier neutrons pushing protons to transfer the energy that goes and comes from God’s Throne, which is the source (like the big lake behind the dam) of all energy in the universe. God’s Throne simultaneously refuels three universe theater stages: the Heh, Daleth and Jod dimensions. Neutron mail carriers and must be recharged 100% each cycle, like the water refilling the lake behind the dam. It keeps the universe running like a gigantic cyclotron just as electricity from the dam keeps our civilization running. 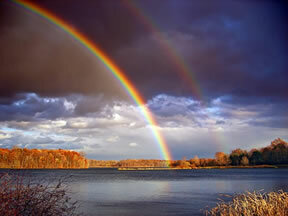 The dual rainbow seen in the picture reveals a mystery showing us the resonance between a Daleth and Heh dimensions. It functions like a transformer transferring the invisible energy from the heavenly Heh dimension to usable energy in the material universe the Daleth dimension sustainable for our use on earth. It is analogous to when we hit a low “C” key on the piano the next octave higher “c” will resonate with a frequency that transfers harmonious sound energy we can hear. This concept is totally new to science. The traditional picture of electrons circling around a ball is further advanced to a scientific model where proton-positrons move inside a Donut Atom at the speed of light to produce magnetism, which is squeezed out around and through the donut hole as excess energy must go somewhere and cannot be lost. It is not yet explained by scientists who build even bigger cyclotrons to smash atoms with bigger force. Fractured atoms stuck on the cyclotron Nebel chamber cannot tell the rationale of elements, like manure stuck on a dairy barn, will never tell how many cows got milked. My Donut Atom theory is easier to understand as the apple atom cyclotron plasma beam has many embedded neutrino-protons running around in a circle like a horse and carriage. The running around squeezes magnetism out the walls as only so much space is available within a nuclear atom that creates electricity 90° to the flow of speeding dogs. Now we have a model where energy is ultimately coming from as it is always recycled at God’s Throne via gravity if you understand my thinking. To sum it up, my Donut Atom model works in reverse from a cyclotron perspective creating magnetism and thus changing into light as seen in the Nebel chamber indicating particles with a radiating electromagnetic frequency. This produces elements with spectral lines which end up as elements you will find collected in the Periodic Table. In the real Donut Atomic world - similar to a cyclotron squeezed by magnetism, every time a portion of a converted magnetic ray passes the donut hole its magnetism will be compressed and then expanded on the other side. Thus it is happily pulsating, not pressured, but still forced again through the donut hole. This transfers and converts infinite energy from God’s Throne into the material universe in the form of gravity at a frequency level that works in the physical universe. Conventional science does not know where atomic energy comes from. It stipulates that the electrons forever orbit the atom’s nucleus ball in the center since the Big Bang in the universe 13 billion years ago. But entropy laws teach that that theory is not possible. A nothing evolving into something can not run forever as energy must follow the Second Law: what runs gets hot and loses speed and needs intelligence to direct where it goes. But in my Donut Atom model, the protons-neutrons move around inside the donut hole endlessly without friction connected to the source producing a force called gravity, which can be converted to electromagnetic frequencies depending where it will flow - Daleth or Heh dimension direction according to the electrical three-finger rule. However, it gains momentum back and forth circling inside this gigantic universe cyclotron to start the process over and over in space returning to get recharged again. Energy is never lost according to the First Law of Thermodynamics, so it must go back to the source to be renewed. Just like the water flows down the river into the ocean and returns via clouds and rain in the mountains to start the water cycle all over again. But the law of entropy teaches us that some energy will be lost; therefore, a little less than 100% actually returns. This is designed by God for our benefit. What is leftover from the gravity cycle becomes free energy to fuel the earth as demonstrated by the natural biological life in our world - now explained through DNA. The reduction of energy according to entropy, the Second Law of Thermodynamics, is caused by a parabolic time dimension to make the math equation come out right. That makes the inertia in the universe, like a flywheel, run slower, otherwise it would be spend too fast and explode like an atomic bomb. Eventually all will end, fizzed out in Taw, the last letter in the Hebrew Alphabet. That would surprise Dr. Einstein. He would turn in his grave to fill in the gap he noticed in his theory. His theory could not explain why light is slowing down. I am sure he would be happy to get the answer presented in A Donut Atom Nuclear Story. Check out the Daleth-Heh and Jod dimensions that explain our universe from God’s perspective. Even atheistic science accepts the existence of a multi-dimensional universe. My model combines those three energy forces so they can be transmitted together like the electrician’s three finger rule. A spectral analyzer shows that each one is on a different oscillating energy level. They are bunched together as some donuts are bigger than others, or the three invisible forces cluster to become mass expressed as elements in the Periodic Table. If two donuts come together, the gravity force in the hole gets twice as big because they bunch together with magnetic force fields aligning in the same direction to form a taller hole like two magnets stuck together. We cannot close my story without a good illustration of applied Donut physics. We should look at some galaxies with a dark hole in the center. It is a good graphic image of what is really happening inside a Donut Atom. Since Donut Atoms are constantly born and form, their different stages can be observed in a pulse-star with a black hole - a good example of the early development of the donut-galaxy universe. The micro universe must be seen in the macro universe as the same laws apply. The galaxy hole is like an antenna collecting invisible gravity energy frequencies emanating from the outer universe, which is the metaphysical Heh dimension we call the Throne of Heaven. It sends out infinite, invisible light energy like an ocean throughout the universe, but this energy is scaled down inside the Donut Atom, which becomes a transformer to reduce the infinity light energy to the speed of light of about 186,000 miles/second to balance everything in nature. We should be daily thankful for receiving this free energy gift from God to live a little longer. We can analyze its composition through the spectral lines embedded in the rainbow colors coming from space. This set up makes the Daleth dimension possible as a material or physical dimension now better explained with science. Looking at the Hubble Telescope photographs, we can see the invisible energy sucked into the galaxy hole with gravity acting like an overpowered, gigantic vacuum cleaner. It collects all the invisible energy floating around and evenly distributes it across the universe space dimension, where it becomes concentrated in galactic centers. Inside those gigantic galactic cyclotrons, we can recognize a scaled down energy converter that drives the neutrino-proton like a horse and carriage within every Donut Atom. Ultimately, this energy becomes crystallized as material elements used by business to make some money - like the magnet on my refrigerator. The intense gravity energy is then transferred according to a reversed three-finger electrical rule, 90° to the direction of suction, to generate a current with transformed magnetism. That propels the invisible neutrons pushing and chasing the protons around the apple slices inside the Donut Atom from large diameter to small diameter at the speed of light, which transfers energy scaled down to a lower level crystallized out as elements seen in spectral lines of the Periodic Table. Think. It is like magnets passing a conductor in a generator: they create an electrical current, which is demonstrated by a light bulb plugged into the socket. We can turn the turbine faster - over 60 hertz - along the invisible spectrum going up the electromagnetic frequency curve bypassing TV, radio frequencies, etc. getting higher in frequency past the visible range of visible light and beyond as high up as alpha and gamma rays. In fact, it can go even faster - to beyond material manifestation as marked with ∞ energy in science. That creates higher energy in the generator with a ∞ billion-billion volts. The Donut Atom model is just reversed like a generator or a motor can be, but scaled down for our use. Some scientists may not accept my idea that the atom is shaped like a fat round apple because their thinking needs electrons for the old model. No problem. I have not investigated how negatively charged electrons might be sucked around the apple ball as the magnetic field turns in conjunction with them. That could explain why electrons are moving as the magnetic field is moving too with the positively charged protons to produce polarized magnetism. The accepted atom model says that if the nucleus is the size of a cherry the next electron is 3 miles away, meaning the electrical field greatly affects others in the neighborhood. Some made tests and discovered that the forces communicate with each other over long distances at speeds much faster than the speed of light, which surprised them. The commonly accepted model keeps them from postulating better explanations. The size and strength of a electromagnetic field depends on how the apple donut atoms clump smaller and larger like magnets to vary the size. It remains for the valence department to explain the rules of Donut Atom spooning. Seeing Galaxies in space is visual demonstrating what a Donut Atom looks like, as the same electrical three finger rule law applies to both dimensions either in the Heh and Daleth dimension or this micro- or macro-creation. When I saw these pictures, I sequenced them according to the Donut Atom model. You be the judge! Compare the frozen pictures in time against the background of now static universe photographed by the Hubble telescope. The part pictured here is 2.5 light years in length (the equivalent of 23 million return trips to the Moon). The Cone Nebula presents a pregnant galaxy giving birth. It is like a corral reef spiting out billion Donut Atom babies ticking to create more galaxies in an expanding universe. Notice how the gravity center of polarity separates the Heh dimension from the Daleth dimension. This picture shows Nebula NGC 2392, called Eskimo. It is 5,000 light years from Earth. The next pictures demonstrate the formation stage with Proton–Neutrino polarization. It is the same applied physics whether a Donut Atom or a galaxy. These pictures show the Hourglass Nebula, 8,000 light years away. It is a model of a Donut Atom forming sucking gravity infinite energy in its center. The next two pictures illustrate galactic separation. Notice how they look like cell division: two galaxies forming like a cell nucleus dividing. Saturated Donut Atom protons repel each other to separate in the middle instead of spooning together. I hope you enjoyed the Hubble Telescope's top ten greatest space photographs and my notes along the side. Go to top of the page. Go to Section 1- A New Concept of Atomic Structure. Go to Table of Contents. Use our internal search engine! What is the Time Dimension? You may download any booklet, chapter or article that we have written for free and hand them out to anyone you think might find them of interest. The only restriction is that you cannot make a business out our content.